I’m attending the Advanced Learning Institute’s Internal Communications for a Dispersed Workforce this week. I had the honor of being a panelist on the experts panel discussion yesterday. Throughout the day, I heard a number of companies say they are moving to Office 365 and have questions about what Office 365 tool to use for what purpose. There are a number of resources that I would recommend for answering these questions. Here’s a list of all the applications that you get as part of an E3 subscription. For a summary of what each Office app does, consider the Office 365 Periodic Table by MVP Matt Wade with help from Niels Gregers Johansen. Matt’s also got another infographic called the Document Circle of Life that explains when to use OneDrive versus when to use SharePoint. Click the above image of slide 62 to be taken to it in her slide decks on Slideshare. In the same deck, slide 21 talks about generational communication preferences that you may need to account for in your digital workplace. Specifically, your Inner Loop is those people you people you work on regularly on core projects, while your outer loop is people you connect with openly across the organization. Yammer is for Outer Loop, Teams is for Inner Loop. Except that for smaller companies the distinction becomes blurred – you could just use Teams for both. But for organizations that are on the larger side, Yammer as a company-wide set of discussion forums and Teams as a hub for daily teamwork makes sense. 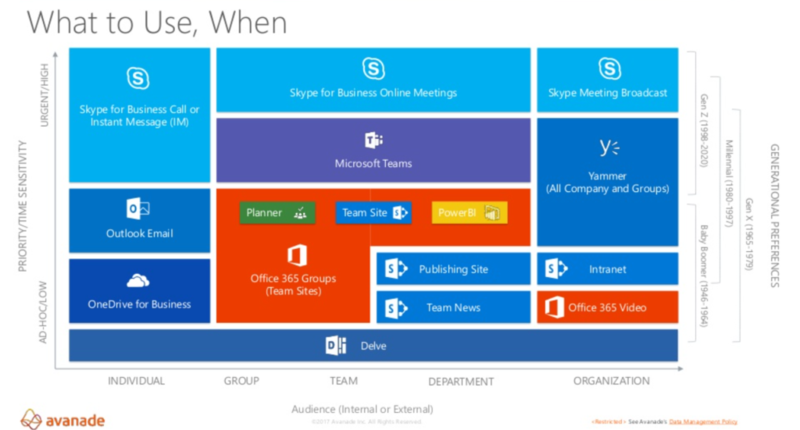 This entry was posted in Office 365, Training, User Adoption by Michael Blumenthal. Bookmark the permalink. Learn about Microsoft Search in Bing at the February Office 365 Adoption User Group (Chicagoland Chapter) meeting! Michael Blumenthal on Learn about Microsoft Search in Bing at the February Office 365 Adoption User Group (Chicagoland Chapter) meeting! Luna Jernberg on Learn about Microsoft Search in Bing at the February Office 365 Adoption User Group (Chicagoland Chapter) meeting! bittin-work on Learn about Microsoft Search in Bing at the February Office 365 Adoption User Group (Chicagoland Chapter) meeting! Michael Blumenthal on I want to teach myself SharePoint. Where do I start? The postings on this site are my own opinions and are not the position of my employer, or its subsidiaries, clients, partners or suppliers. Copyright © 2019 Michael Blumenthal, Office 365 MVP. All Rights Reserved.